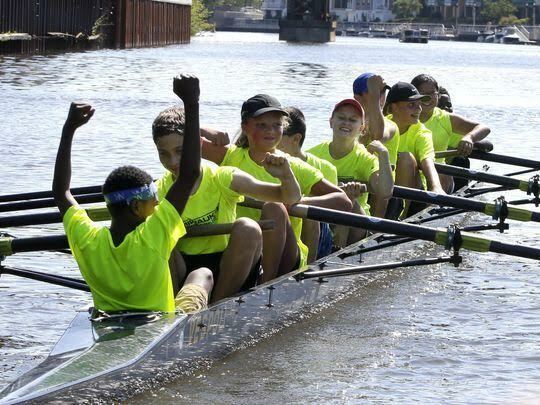 The Milwaukee Rowing Club works to remove barriers to participation in youth rowing. Our goal is to provide rowing opportunities to all students who are interested in becoming a part of our programs. The main barriers to rowing include swimming instruction and transportation in addition to club fees and training gear. Through generous donations the club is able to offer need-based scholarships for our youth program covering registration and regatta fees. The club has also tackled swimming instruction and transportation in order to provide opportunities for those who would not otherwise be able to participate. Through our relationship with Urban Underground, we have access to a van which picks the students up from their homes and takes them to and from practice. Additionally, we have been able to secure a time slot at the YMCA for the students to have swimming lessons before attending practice. A typical day for these students involves being picked up from their home, taken to the YMCA for swimming, then to rowing practice, and finally back home again. This outreach effort began in the Fall of 2016 and has blossomed due to expanding interest. These students row with our existing youth programs/teams. Our middle school and our high school programs practice year round, giving opportunities both on the water and indoors through the winter months. Our program is pleased to be able to offer rowing to students from throughout the Milwaukee area, and will continue to grow this program in the coming years. If you are interested in participating in our program and you are a student qualifying for free or reduced priced lunch, please contact our Outreach Coordinator, Will Bott (williamlbott@gmail.com), for more information and details on how you can become involved. You can also begin your process by applying for a need-based scholarship by clicking the button below. If you are interested in donating to our Outreach Effort click the button below to donate to our program. We appreciate any amount as it provides positive opportunities for Milwaukee's youth.